Hollersbach is a village in the Pinzgau area of Salzburg. 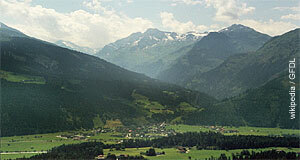 It has a population of approximately 1,200 residents and is one of the communities within the National Park Hohe Tauern. Hollersbach is situated at the onset of a valley of the same name and popular as a base for hiking excursions into the national park. For hiking and mountaineering, Hollersbach makes an excellent base. Beyond that, however, the village has little to offer. The parish church was built in 1893, after a previous church from the 14th century was demolished (no idea why this was done). A more appealing sight is the Klausnerhaus, a farm that was first mentioned in a written document from 1350. It is a typical farm for the Pinzgau region with a base made of local stone and the second floor and roof made of wood. Today, the Klausnerhaus is no longer a farm. It is home to a local studio of the National Broadcast ORF as well as an information centre of the National Park (not to be confused with the bigger visitor centres, such as the one in nearby Mittersill). In addition, there is a small permanent exhibition on local life and medical herbs grown in the Pinzgau, as well as a seminar centre where you can rent rooms. Another attraction is the so-called Panoramabahn, a cable car between Hollersbach and the skiing region of Kitzbühl via the Pass Thurn. In the village centre of Hollersbach, you will find the Kramerstall. The former stable of an old farmhouse hosts the Kunsthalle Kramerstall, an exhibition venue and cultural centre. It is home to the Internationale Hollersbacher Malwochen, a series of painting events. There are three workshops in the Kramerstall which artists can rent for a limited amount of time. Otherwise, enjoy the general appeal of an Alpine village and look into some hiking around Hollersbach.